The US Air Force’s secretive X-37B spaceplane landed yesterday after 718 days in orbit—just twelve days shy of a full two years. What was it doing up there in the sky? The government won’t say. Even the spaceplane’s budget is a secret. But the X-37B’s landing wasn’t so stealth. The spaceplane caused a sonic boom that woke up people living near NASA’s Kennedy Space Center in Florida. The secret, reusable spaceplane is made by Boeing and is unmanned, allowing it to conduct extended missions, even if the public has no idea what those missions might be. This was the X-37B’s fourth mission (all secret, of course) and the spaceplane typically lands in California, not Florida. Again, we don’t know enough about the spaceplane’s purpose to speculate about why it landed in Florida and woke up the neighbors this time around. The spaceplane beat its own previous record of 674 days in orbit after landing in October of 2014. At that time the speculation was that the US Air Force was using the X-37B for some kind of surveillance of China’s space station. The X-37B Orbital Test Vehicle (OTV) has now spent an astonishing 2,085 cumulative days in orbit since its first mission in April of 2010. When the spaceplane first took off on its most recent mission on May 20, 2015, David Bowie, Leonard Cohen, and Prince were all still alive, and Donald Trump was still a month out from announcing his bid for president—something that was met with little more than jokes at the time. “The landing of OTV-4 marks another success for the X-37B program and the nation,” X-37B program manager Lt. Col. Ron Fehlen said in a statement without giving away the plot of this real-life mystery movie we seem to be living in. The Air Force provided three videos of the landing, along with two photos. We’ve uploaded the three videos above for your viewing pleasure. As best I can tell, there’s no E.T. in sight. But it’s a good thing that this mini-shuttle is unmanned. If I’d left Earth in May of 2015 and had a two year mission I’m not sure I’d want to come back in 2017. 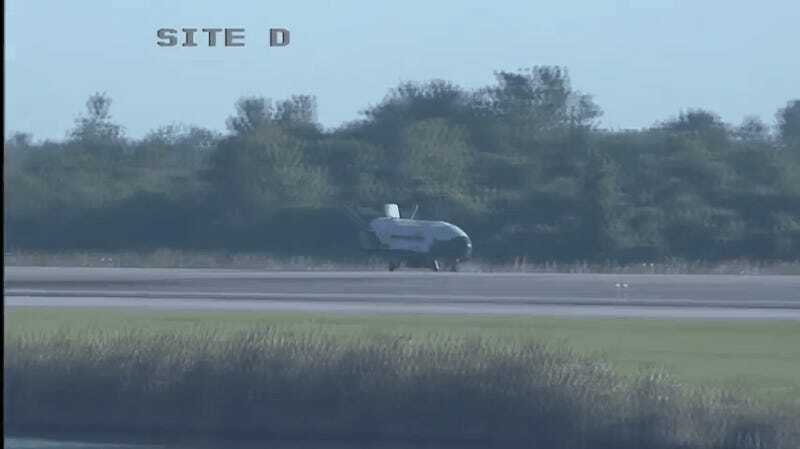 Update, 12:10pm: The US Air Force just released a few more photos of the X-37B on its way to a hangar at the Kennedy Space Center.